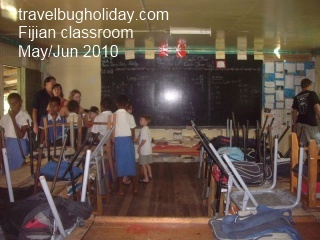 attended a local Fijian primary school and donations from tourist have made further education possible for all the local children. These children might have to trek a few days by foot to get to a school if not for the donations by foreigners. Schools are now built near their community. These children are so interesting, very friendly and talented especially in dancing and singing. I thoroughly enjoyed my visit to this school and having the opportunity to meet and talk to the students and teachers. My driver told us that the Indians Fijian descendents are mainly in the retail business and the restaurateurs are of Chinese decent. I did see many Chinese running all kinds of restaurant in Nadi and Suva town. Apparently they also celebrate their Chinese New Year festival in a big way in Fiji. powder. The powder is mixed with water according to the strength required, strained and served. I was hesitant to try as it looks like muddy water. Funnily enough, it does taste like muddy water !. I still prefer my milky Earl Grey tea anytime. I didn’t feel any numbing of my tongue and lips as I was told to expect but I suppose I didn’t drink enough to feel that sensation. 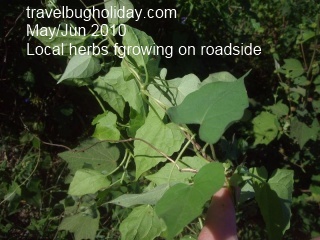 I was also told that it is not alcoholic but it has mild narcotic properties. I presume they won’t have serve us a strong potion anyway. 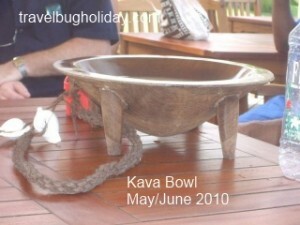 I wonder how much a local Fijian drinks this daily. Some says 50 cups will get you to a different frame of mind ! At one of the village tours, I observe the ladies creating mats, masi (tapa) hats, fans and baskets from natural materials. I also saw pottery being made the traditional way or attend a talanoa session (storytelling) about history, legends and traditional local medicines by the local chief. 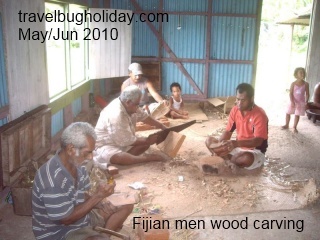 I am impressed by the village (men) wood carving skills at one of the wood carving workshop. 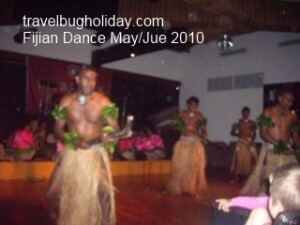 song and dance)You will experience many Fijian dancing at both the Hilton and Warwick. At the Warwick, it is almost daily event which is a bonus otherwise I will be bored as it is just too far to walk to the next hotel as compared to in the Denarau island. 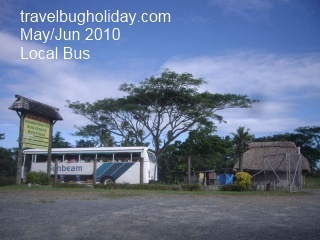 You will be expected to take part in a meke, as part of their culture is to include guests. 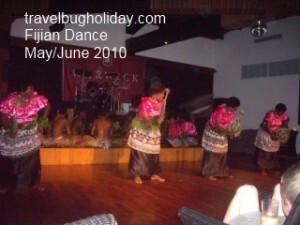 The locals dress entirely in the national costume of flower leis, grass skirts and tapa cloth. The men perform warrior/fire dances while the women sing/dance and some women even did the fire dancing as well. partitions, just one open space inside. 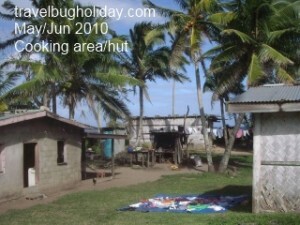 The traditional Fijian house would be made of straw roof but that kind of roofing can only sustain two or three cyclones. Nowadays they use corragated irons. A normal house will house about 8 people. 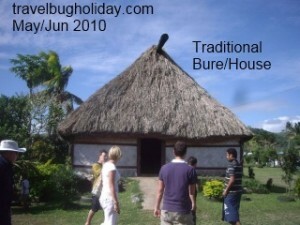 These Bure are not long houses but more of a square shape. That day, a death had taken place and apparently the body of the deceased will be place at the back part of the house (under the same roof) and prayers will be said and the body will stay there for approx a day before burial. Very priviledge to be able to witness the area where the deceased will be. 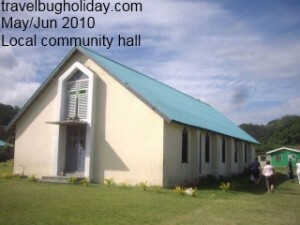 The biggest houses in the village are the community halls and church. 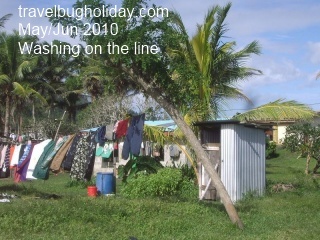 Cooking are done outside and clothes are dried outside. I didn’t notice any cupboards in the house. 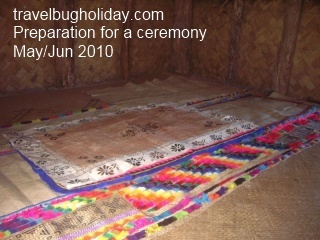 Infact the inside of the houses are bare except for the mats on the floor. These mats are weaved from pandanas leaves (takes a couple of days to make) I also noticed that all the dry clean clothes are often sunned outside daily in a pile on a mat (for freshness, I presume). Fijian culture is a sharing community such as if you run of food to eat, you know you can always pop over next door and you won’t go hungry. 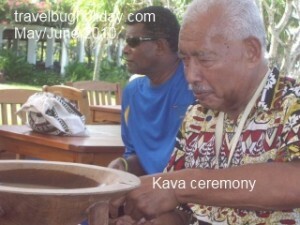 Maybe that is why Fijians do not own retail shops or restaurants as all other Fijians might pop over for ‘stuff’ ! 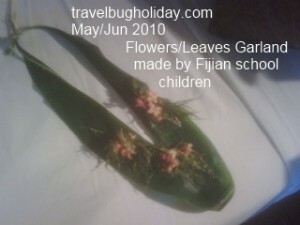 The Fijian way of life now is mainly leasing their land to hotels and other island settlers and planting vegetables and collecting fruit trees (sometimes fruits from the jungle) and sell them along the roadside or to the resorts or restaurants. Most of the local Fijians are now employed by the hotels and resorts as well. They are very self sufficient group of people. Woman and men spear fish from the sea, men farm and the women folks sell their fruits and vegetables. They have a few pigs, cows and chicken and the men regularly supplement their meat from the sea.